The Mystery House is nothing more than a bonus section of the game that works like a lottery -- handing out free stuff to players every day (or every 48 hours on two of them). When you get inside the Mystery House, there are 3 points of interests to choose from. All of which give you a number of free lottery tickets that could potentially draw out a rare item every day. Although relatively free to play, you basically are limited to a number of tickets per day -- but do note that the option to purchase more tickets with Diamonds or Coins is there. In the Pavillon of Mystery, you get 2 free tickets everyday. If you wish to try more than 2 draws in a day, you have the option to buy more tickets with Coins. Every time you play the lottery, regardless if you win or not, you'll always get crystal shoe shard as consolation. When you get to collect 50 pieces of these, it will form the complete crystal shoe -- which in return, can be exchanged for unique items in the "Room of Cinderella". In the Pavillon of Fantasy, you get 1 free ticket everyday. If you wish to try more than that free draw in a day, you have the option to buy more tickets with Diamonds. Also, this lottery guarantees items rated 3 to 5 Stars. Every time you play in this pavillon, the consolation each time is a crystal shoe -- which in return, can be exchanged for unique items in the "Room of Cinderella". Lastly there is the Porch of Misty -- which hands out 1 lottery ticket only every after 48 hours. 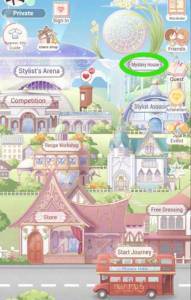 The Porch of Misty also guarantees items rated 3 to 5 stars like the Pavillon of Fantasy. However, instead of the crystal shoe consolation, what you'll get is Jade. This item in return can be exchanged at the Pavillon of Jade for items from the Flower in the Mirror and the Moon in Water outfit sets.